The digital age has drastically changed the dissemination and amount of information available on a daily basis. Printed media are struggling, as news flashes arrive on our mobile phones within seconds of breaking news. Many of us subscribe to news media in digital form, saving postage and paper! In fact, we all have turned into roving reporters, snapping photos and posting news via Facebook and Twitter. In light of these changes, the Comms team has decided to introduce a new type of news bulletin which will better meet today’s information needs. Even in the best of times, The Link in printed form only reached about a third of SIE members. To cover the costs of production, it was necessary to charge a subscription fee, and for this reason, it was not possible to make the magazine available online. In the last biennium SIE tried a purely online version, which saved postage and printing costs, but was nevertheless cost intensive in terms of time. Although the response was positive, research showed that many Soroptimists were unaware of the magazine or only fleetingly read the content. And finally, the topicality of the online magazine was not improved compared with the printed version. With an email news bulletin, the Federation can distribute readable and topical information fast and cost effectively. The email provides teasers which link to the SIE website for the full story, thus encouraging more website hits. Production costs can be kept to a minimum because the bulletin will be produced in-house. 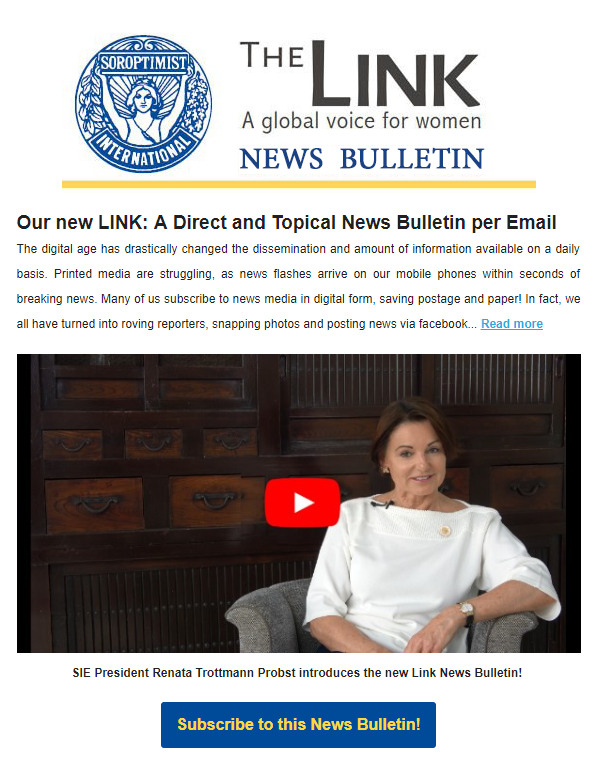 Union and Single Club Presidents as well as Governors will receive the HTML bulletin automatically, but every Soroptimist can subscribe – free of charge. Ideally, readers will forward their email bulletin to other members to widen the circulation. The aim is to reach as many Soroptimists as possible and distribute one issue per month. In order to get a better feel for the kind of information our readers want, we have included the following two-question survey, which can be accessed here. Enjoy the news – and please let us know your thoughts and suggestions for improvement. Your constructive feedback is much appreciated! Click here to view the first issue and here to subscribe!